Sonia at the National Woman's Party Alice Award (named for Alice Paul) Gala Reception and Dinner, Sewall-Belmont House, Washington, D.C., June 10, 2003. 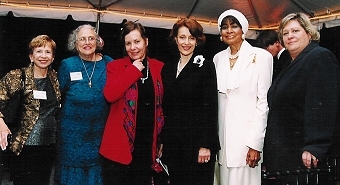 Pictured from left to right: Sonia; Naomi Grupp, mother of National Woman's Party Board member, Beth Grupp; Martha (Marty) J. Langelan, president, National Woman's Party; Evelyn H. Lauder, senior corporate vice president of the Estee Lauder Companies and founder and chairman of the Breast Cancer Research Foundation, recipient of the Alice Award; Dr. C. DeLores Tucker, former Secretary of State of Pennsylvania and founder and national chair of the National Congress of Black Women, Inc.; and Susan B. Jollie, president, National Women's History Museum. Courtesy of Lana R. Lawrence.